There is now probably no better method of converting company monies into personal wealth than through a Director’s pension scheme. Contributions deductible against corporation tax. Lump sum death & disability benefit may be included. Early retirement from age 50. Pension fund grows tax free. No benefit in kind implications. 25% tax free cash at retirement. HOW MUCH CAN A PROPRIETARY DIRECTOR INVEST INTO A PENSION FUND? A common misconception pertains to the level of pension investment allowable by Revenue. Many think that 15% or 20% of earnings is about right. However, the amount of money a company can contribute to a director’s pension on behalf of a proprietary director can be substantial. 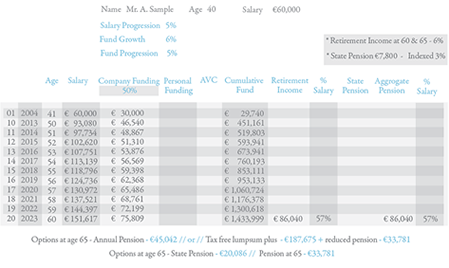 A company may make whatever contributions are necessary to build up a pension fund which will provide a director with a pension of 2/3rds of final pensionable salary – subject to a maximum salary of €150,000 and a maximum funbd value of €5.4m. The chart below shows the maximum contributions an employer could make and get full tax relief on these payments. The figures assume that no existing pension provision and 10 years pensionable service at age 60. Of course the above scenario will only suit a relatively small number of business owners. It is ideally suited to those with substantial cash reserves who are looking for tax efficient methods of converting company monies into personal wealth. Most business owners will adopt a more long-term, structured approach to pension funding. 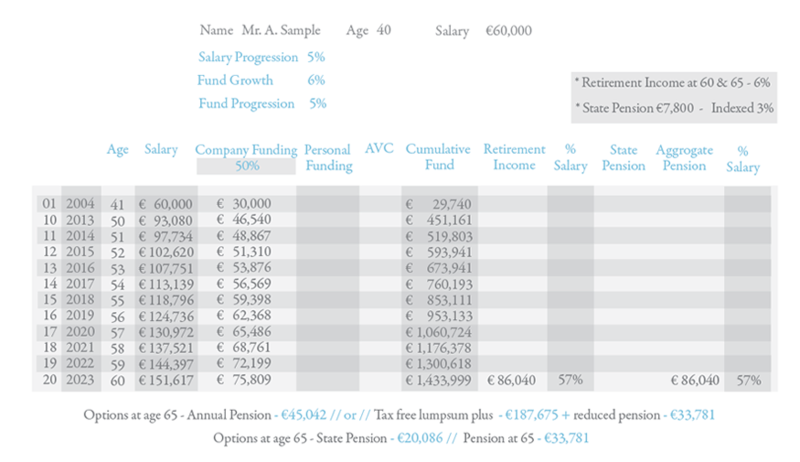 Let’s look at an example of a company with a surplus of €50,000 each year for 5 years prior to retirement. Lets’ assume this fictional Director has no interest in ARFs – he simply wants to access to full amount at retirement age 65. This compares to €132,500 had the surplus been paid as salary. In addition, John has saved his company Corporation Tax of €31,250 in the process (assuming 12.5%). Our award-winning *Pension Model (sample below) allows us, with the client, to chart a likely course and monitor progress on an annual basis.